The numbers are impressive: Twenty bowl game appearances. Dozens of All-Americans. Five members of the College Football Hall of Fame. Countless statistical milestones. But the numbers alone don't do justice to the impact that Oregon football has had and continues to have on its legion of fans. What takes place within the storied confines of Autzen Stadium is more than simply a game; it's a way of life. Oregon has become synonymous with college football excellence—and that excellence shows no signs of diminishing. From the fabled exploits of "the Flying Dutchman," Norm Van Brocklin, to the quarterback legacy re-established by Chris Miller and Bill Musgrave and sustained by Joey Harrington, to the ferocious play of defenders like Haloti Ngata and Peter Sirmon, the Ducks have given their fans countless cherished memories. Today's great players continue to be attracted to Eugene by the unique image that Oregon football projects, ensuring that the tradition established by Duck legends of yesterday will live on. Coach Mike Bellotti described the Oregon football tradition this way on the occasion of the Ducks' 35–30 win over Texas in the 2000 Holiday Bowl: "These kids, I don't know how many times I can say it, but the whole really is greater than the sum of the parts. That right there, that's what Oregon football is all about." 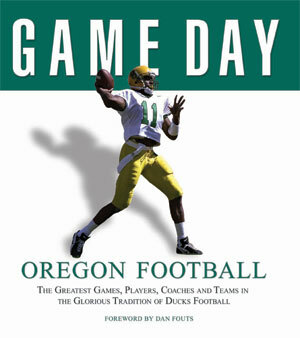 Game Day Oregon Football is a celebration of the pride that all Duck players and fans share, and of the decades of gridiron excellence that have inspired it.